My aim is to develop an innovative participatory approach in biodiversity conservation and livelihood development to contribute for poverty reduction and ensuring food security. Picture from Dodola community-based ecotourism during field data collection. I graduated with a Master of Science in Tropical Forestry and Management from Technische Universitat Dresden, Germany, where I studied in depth about tropical forest management and related issues. During my Bachelor course in Natural Resource Management from Hawassa University Wondo Genet College of Forestry and Natural Resources, I gained fundamental knowledge on natural resource management, indigenous knowledge and extension, mainly on how to approach needy groups in rural settings and other development interventions. I also received a Diploma in Animal Science from Addis Ababa University where I was technically equipped with basic knowledge on animal husbandry and health. In addition to my education background, a decade-long worth of practical experiences in rural development projects and working opportunities have helped me to be enthusiastic and personally committed in many areas. I have developed demonstrable work experiences in integrated rural development projects of the Ethiopian Evangelical Church Mekane Yesus South Central Ethiopia Synod namely Wata Dara Shilcho I/R/D project & Bensa-Arbegona I/R/D Project respectively. Both projects were funded by Brot für die Welt (Bread for the world, Germany), and mainly focused on addressing food security problems and improving livelihood situation of the rural community by empowering them through capacity building and self-sustaining techniques. In these projects, I worked as Livestock Husbandry and Natural Resource Management section supervisor and was sometimes delegated to coordinate the office work in the absence of the project manager. During my 10 year stay, I gained useful experience in working with the rural community and different project partners/stakeholders. Working in a diversified culture of the rural people was an asset to me to understand their social interaction and coping strategies with the external environment. Community training in improved beekeeping technology at college apiary sites. 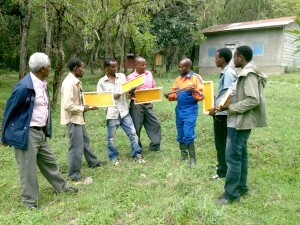 Diversifying Rural Livelihoods of Smallholder Farmers and Improving Nature Conservation: Introducing Improved Beekeeping Technologies at Wondo Genet Catchment, Southern Ethiopia. This project is aimed to enhance the livelihood of smallholder farmers and in turn reduce the dependence of farmers on the natural resources particularly the forest resources around the Wondo Genet area. 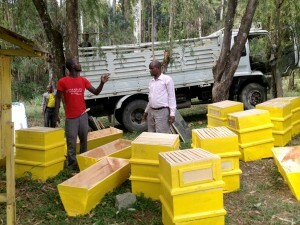 Bee hives purchased and distributed to farmers. 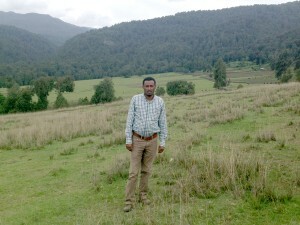 In the future, I have a passion to work on the amalgamation of biodiversity conservation and livelihood improvement of small holder farmers for the sustainable development in the region in general and Ethiopia in particular. In addition, I have received an acceptance letter from Kassel University of Germany to continue my PhD study on ‘Applicability and Use of Information Technologies in Precision Beekeeping for Monitoring of Tropical Honey-bees’. The application of this technology offers new possibilities for developing efficient and sustainable beekeeping under tropical environmental conditions.